These are murals of The Great Mexican Immigration. Painted on the walls of The Mission District of San Francisco, the best of them inhabit a vision of humanity not unlike the Christian-themed paintings byTitian in the churches of Venice. And like the relatively cartoonish iconography that evolved in American churches, the second generation murals in The Mission seem to lack the depth of their first generation ancestors. Richie Havens and George Jones, an unlikely pair, both gone in the same week. Their lives differed geographically, racially, and creatively, not to mention in their choice of intoxicants. They played for mostly different audiences, but play they did, for entire full lifetimes. Both live on as Gods in the American Pantheon. 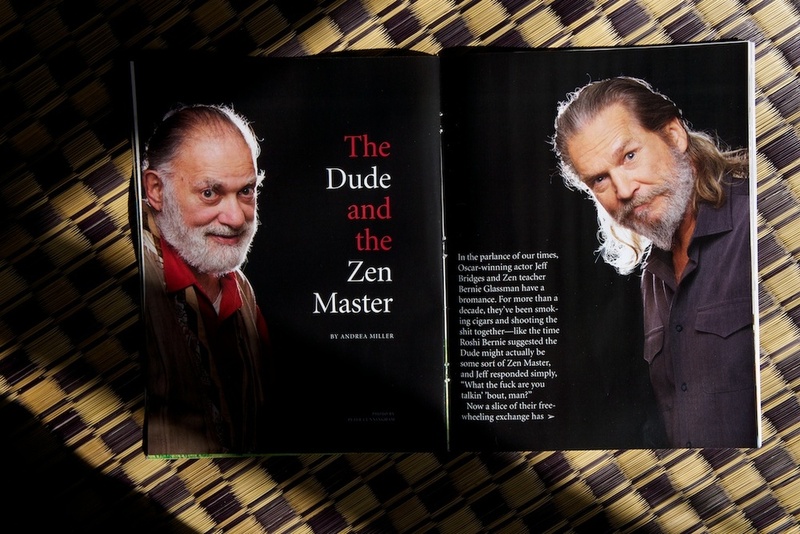 I felt honored when Shambhala Sun asked me to create a cover photograph of Two Dudes (Jeff Bridges and Bernie Glassman) at The Four Seasons in New York. The purpose of a cover picture is to sell magazines, the restriction is you have to leave room for the title and type. They also asked me to supply photographs of Bernie's work over the years; they published pictures from his work in Auschwitz, his work founding the Greyston childcare center, and from his formal Zen studies with Maezumi Roshi. Bernie and Jeff have just published a book entitled "The Zen Master and The Dude", it's drawn from conversations between these two friends. Most of the talk was conducted face to face or walking side by side, but the last conversation was held over a skype connection between California and Massachusetts. I've been traveling with Bernie for over 30 years, I'm always the one behind the camera, so I'm pleased to have our first picture together. Thanks Jeff! These are the woods where Henry David Thoreau first wanted to build a cabin. Ephraim Flint, owner of the land around Flints Pond in the mid 19th century and my classmate Ephraim’s ancestor, turned down his request. Thoreau had a reputation for being a firebug. He subsequently built his cabin a mile away on Walden Pond and drew his revenge ranting on for two pages about the “bourgeois skinflint farmers” who controlled the local land. I believe that phrase pre-existed the incident, but what afortunate a coincidence of language for a creative writer! For twenty years they’ve been talking about building a road through this suburban wilderness in the town of Lincoln, 20 miles West of Boston. It’s not a simple case. Safety, not greed is the motivation. The East-West highway, Rt 2, runs just to the North of the house my father built by hand in 1948; he and others built driveways that flow into the big road. That was ok in 1948, but now the cars are faster and the trucks are bigger, and it’s no longer a safe situation. The democratic process takes time, committees and town meetings, state rulings and national standards, but finally, last summer, final decisions were made and the old rumors turned to orange ribbons hanging from trees, stakes driven in the leaves, and spray paint to mark the ledges. I could only guess what the markers meant, but they certainly did go right across the ancient stone walls, the heritage of the colonial farmers who had cleared the land by hand and oxen, the stone walls I had come to think of as “American Ruins”. Then, in snow, the machines, big astonishing machines swinging their hungry heads like giant dinasours, arrived in Thoreau’s woods, the woods I had been born into. The woods where I had learned to herringbone and gotten lyme disease, where I walked with so many now dead ancestors, where I was first taken to the ground by a high school girl who knew desire before I did, these woods were about to change. It was to be neither for better nor for worse, it was just change. The biggest surprise about the K-5 classrooms in New York City is how damn excellent they are. The general public has been sold the idea that the schools are a shambles, but I see a radically different evidence. For many years I've been illustrating books for Lucy Calkins from Columbia Teachers' College, so I've had the privilege of dipping into schools in all neighborhoods of the city as well as those in the wealthier suburbs. Even in so-called "failing" schools in The Bronx I find a beautiful rainbow of students fully engaged in ideas and discussions. By fifth grade the level of discussion is more sophisticated and animated than at most adult dinner parties! This year Lucy reorganized her books about teaching the art of writing, so there's a series for each grade. I recommend them for curious people of all ages. Heinemann Publishing just launched 32 different books for which I did all the covers and interior images, they gave me title page credit and they are national best sellers in the school market. Notice the titles of the books. There's much debate about the competitiveness of American schools, but I can't imagine any system in any country hosting healthier classrooms than these. The kids know how to be observant, to THINK, and how to express what's in their heads. I'm proud of my association with this part of the American education system. I made a book for Bernie Glassman's 75th birthday. “The Thousand Armed Bodisahatvha", or "Kannon” is a traditional Buddhist symbol. He/She symbolizes an enlightened being who chooses, rather than departing for Nirvana, to remain on Earth until all “sentient beings” are also enlightened. In statuary she is often depicted as a sensuous female with a thousand arms indicating the myriad ways in which she is attempting to serve all human beings. Assembling 33 years of photographs from my adventures with Bernie, I was struck with the incredible variety of skillful means this human from Brighton Beach has managed to embody, thus the title. Bernie sometimes works with people who feel discarded. The photograph on the cover of this book is scanned from a kodachrome slide I discovered under a leg of my desk where, covered with dust, it had molded for years. It was ruined, a piece of trash nearly tossed in the rubbish years ago. When assembling the pictures for this book, this old slide jumped to my attention and resurrected itself, and now, reimagined and repurposed, it’s become the cover of Bernie’s birthday book. When I thought of using this name for the book, I knew I wanted a photograph of a thousand arm statue, I visited both the Museum of Fine Arts in Boston and the Metropolitan Museum in New York, but I only found sitting Buddhas. I finally used one from Bernie's collection, but I realize that the idea of an enlightened being being socially active is relatively new in this country. Western practice grew up with the idea that the enlightened state was to be symbolized by a figure sitting on a cushion (the eighth stage of the Ox Herding pictures), forgetting the last two Ox-herding pictures in which the man "returns to the marketplace" and looks like everyone else. The Thousand Armed statue is a better symbol of the current wave of socially active Buddhist practice, the museums need to catch up! You can see a full preview of the book here; I recommend clicking the full screen button on the lower left. Instructed to respect library silence, in seventh grade I learned to giggle in this building. At age 18 I left Lincoln, and after college I picked up a camera, then I spent 40 eventful years in Manhattan as a professional photographer. With this playful exhibition I return to the place where I first learned to play. It began as a whim. Struck by the memories and the beauty I rediscovered in this library, I wondered what would happen if I presented a series of images that were all found within the building that housed the gallery where the prints were to beshown. I’d call the show HERE to illustrate the basic principle that beauty is always ready to be discovered for those who can see under their feet and beyond their nose. The secret, an open secret, one that we all know, is to consistently step into the ever-changing present with open eyes and a ready heart. Over the years I’ve learned that seemingly simple ideas can invoke an arduous path to completion, so it was a surprise to me that this project seemed effortless: all the hours of creation, photographing, pairing, printing, framing, hanging, even writing this paragraph, went by naturally, like breathing in and breathing out. That’s unusual, but is probably so because I had spent all those many years developing the skills of my profession; now I could return home and what might have been perceived as hard work became, for me, carefree play. Please enjoy the pictures. Those of you who are physically inside the library, see if you can find the spots where theseimages were found, then see if you can find a few more that I’ve missed, I do that myself every time I return, it’s a quest without end. Ten years ago today, the Bush-Cheney American government invaded Iraq. Some believed Mr.Hussein was a threat to the American homeland, but the millions of people who marched in the streets that Fall and Winter disagreed. They believed they were being actively deceived by disinformation and manipulated by fear mongers. Artists did their best to tell their version of truth. [wpvideo OHjp54iI] These posters were drawn by Lisa Herman Cunningham and glued to popsicle sticks. I took them on my bicycle around New York matching them to backgrounds; I'd just hold the popsicle stick at arms length and make the picture with the other hand; we made postcards which were distributed around the country that winter as well as a website and a film. I think our phrases stand up pretty well after ten years, but they failed to stop the invasion. The night the bombs fell on Bagdad I kept repeating the phrase, "I really hope they know what they're doing". They didn't. The fact that Mr.Bush, Mr.Cheney, and Mr.Rumsfeld didn't even have a plan for the day after shock and awe was a criminal failure of leadership. I knew they were mendacious but still can't conceive of how they could have been so incompetent. I suspect they still have a psychological condition that robs them of the capacity for shame.